Galerie m Bochum was the site of Keiko Sadakane’s first solo exhibition 10 years ago. Ever since then, the gallery has closely followed the development of the artist, who was born in 1948 in Tokyo, and has mounted several exhibitions of her work. Keiko Sadakane is known for works that are both concrete and conceptual, based on a strictly systematic approach and a clear geometric language of form. Although grounded in simple, logical calculations, her pieces are nonetheless perceptually complex and seem to inhabit a poetic state. This results in part from Sadakane’s sensitive use of various materials in connection with painting. She uses, for example, aluminum, steel or wood as base, onto which she applies white surfaces of gesso, a mixture of plaster and acrylic. Although these areas evince traces of the brush or palette knife, their smooth whiteness makes them appear transparent and virtually immaterial. With this interplay of rational system and sensuous materiality and painting, Sadakane creates an atmosphere of serene clarity and enigmatic suspense, combining a cool minimalist aesthetic with magnetic beauty and delicateness. In addition to the VOLUMINA pieces, which make up part of the series of works described above, the current exhibition also features a completely new aspect of Sadakane’s artistic development: the incorporation of color and text. 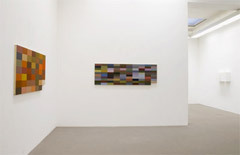 On display are room installations made up of related text and color panels, as well as pure color pieces that Sadakane conceived expressly for this show. Without sacrificing the clarity of a concrete repertoire of form, another level in Sadakane’s work has emerged here: the realm of the narrative and associative. Her color scale stems from the Japanese color aesthetic, which favors muddy, in-between tones. 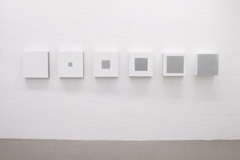 The base colors of the works on display are gray or brown, which are mixed with additional pure colors to create new nuances and then arranged into a chromatic tonal harmony. These word and color installations open up a wide field for the viewer’s own associations and discoveries, encouraging him to muse on the impressions evoked by the various words and colors and how they interact. Keiko Sadakane fuses form, color and text in an intensely varied and stimulating way, finding her own space for narrative within the bounds of the concrete.